MyWebhost Review 2019: Is MyWebhost a Good Hosting? MyWebhost has been many people’s web host since 2003. It targets small and medium-sized businesses in Norway with relatively cheap hosting plans that benefit from 99.96% uptime. 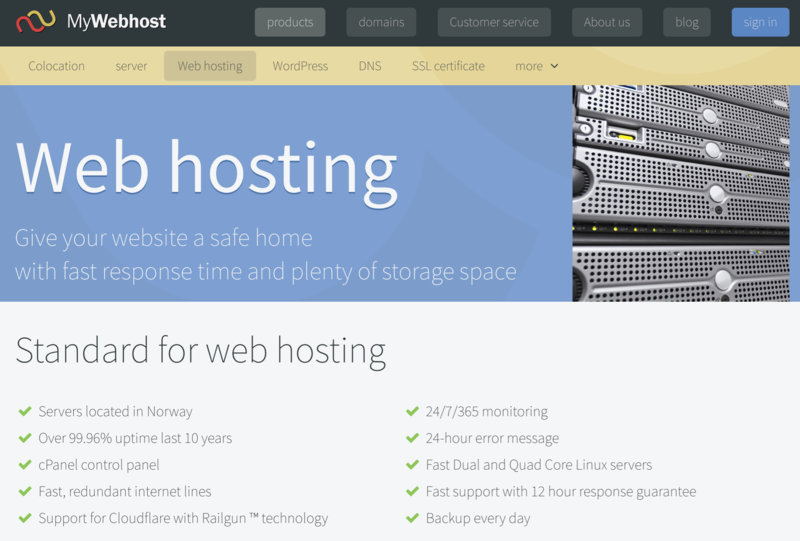 Norwegian hosting provider MyWebhost ANS (or simply MyWebhost) was founded in 2003. This company is backed by an experienced team of hosting industry experts, and it provides shared hosting, dedicated servers, colocation services, and VPS solutions to mainly medium-sized businesses in Norway. 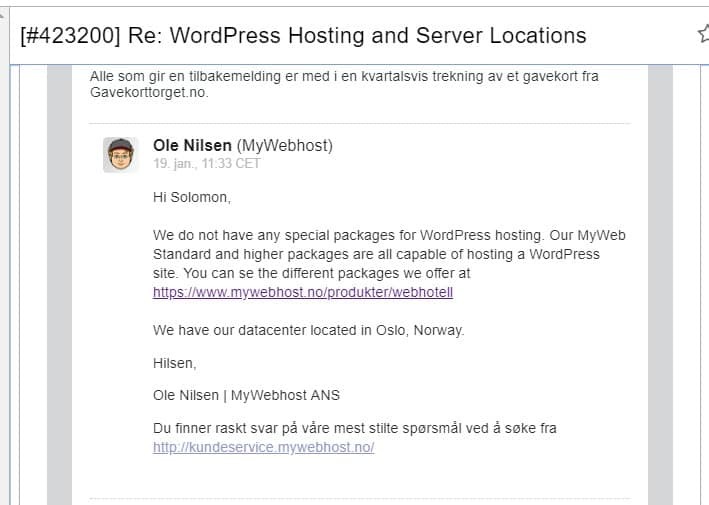 The MyWebhost website is only available in Norwegian. This vendor’s servers are located in an Oslo data center with modern server rooms connected to redundant internet connections, and with 24-hour infrastructure monitoring plus redundant power supplies. Digging down into the detail, the hosting infrastructure is powered by Dell hardware, and the network is connected to NIX (the interconnection point for Norwegian service providers). Also, the network uses Border Gateway Protocol (BGP) routing for when one line goes down, which provides excellent uptime and enhances server reliability. MyWebhost’s hosting packages have plenty of disk space and plenty of built-in tools to help you create and run your website. The “MyWeb Light” starter package offers 10 GB disk space, 20 GB data transfer, unlimited email accounts, and unlimited subdomains. The top-of-the-range “MyWeb Pro” package provides 70 GB disk space and unlimited data transfer. All the packages support various versions of PHP and come with a free SSL certificate, although you can pay extra for more enhanced SSL certificate packages powered by Comodo, GeoTrust, and Trustware. MyWebhost’s hosting plans are relatively cheap, and most of them have no apparent feature restrictions. Prices are listed in Norwegian krone, and clients can subscribe to the plans on a monthly or yearly basis. Although this vendor can customize web hosting solutions for individuals and businesses, these customized solutions are offered at significantly higher prices than other hosting services. The company promises an uptime of over 99.96%, and it has a 30-day free trial period so you have some time to try before you buy. This vendor also has a pretty comprehensive and nicely laid out knowledge base that combines detailed tutorials with informative articles. MyWebhost has invested in modern, high-security data centers where customers can lease servers and buy space to install their own servers. Its hosting solutions are feature-rich and backed by a responsive support team. Wondering how MyWebhost stacks up against other Web Hosting companies? Enter any other Web Hosting company and we will give you a side-by-side comparison.